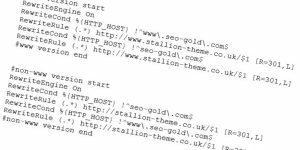 Looking back at Stallion Responsive traffic stats (on this website which runs the Stallion Responsive WordPress SEO Package) and looks like the Google Panda 4.0 algorithm update (from May 2014) liked Stallion Responsive 8 a LOT. 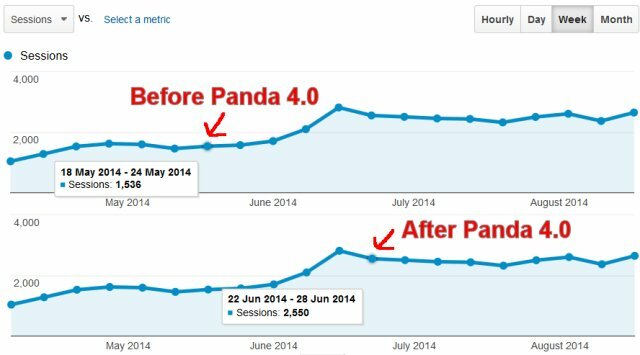 The sessions (unique visits) on this domain according to Google Analytics increased by around 40% looking at the period just before the Google Panda 4.0 update and about a month after the algo update. The screenshot above is from Google Analytics for this domain, it’s two screenshots in one of the same Google Analytics graph hovering over different periods, a before and after Google Panda 4 time periods. Added red arrows to indicate which week I hovered over as it’s difficult to see the highlighting. 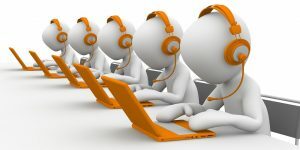 Over the space of a month sessions increased by about 1,000 for the period measured, which is around a 40% traffic increase. This site is in a relatively low traffic very competitive niche, as you can imagine trying to gain search engine optimization relevant SERPs on a new site is NOT easy. Requires optimized content and for anything even remotely competitive backlinks which take time, up to a year for new backlinks to pass full SEO benefit. Although I’ve owned this domain for more than a year, started adding content to it in February 2014 (before then had a couple of holding pages that generated a handful of visitors), so the site is only 6 months old. The screenshot below shows the session data for this year (January 1st 2014 to August 23rd 2014) to show it’s growth. As you can see before February 2014 (when I added content) this domain had practically no traffic. It’s so new there’s not been a PageRank update yet and the home page has a PR0 (as of August 24th 2014) which shows the domain had no backlinks before 2014. Can’t wait to see how Stallion Responsive 8.1 (latest update) ranks when the current backlinks have aged a year and more backlinks have been added overtime. You know in hindsight I couldn’t have made my job more difficult, I own over 100 domains and rather than using one of them (some are PR4+ home pages) I used a new domain (PR0) which pretty much adds a year delay in serious Google rankings, DOH! I put a lot of SEO work into Stallion Responsive (most of it in v8.0) to cope with previous Google Panda updates and looks like it’s still working well for new Panda updates like Panda 4.0. 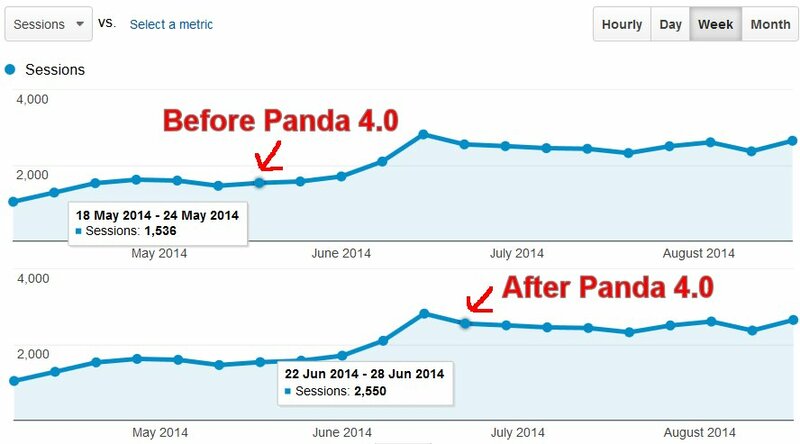 As you can see from the first graph I’ve covered data from April to yesterday (August 23rd 2014) and the traffic has remained stable since the Panda 4.0 increase. Stallion Responsive 8.1 was released earlier this month and this was another big SEO update, most on the performance SEO side. I don’t think current Google algorithms are taking performance into account as a big ranking factor, but based on what Google has been ‘saying’, performance SEO looks set to be the next big thing in SEO 2015 and Stallion Responsive 8.1 is way ahead of the game.